This year saw well over 100 young Witches, Goblins, Ghosts (only friendly Casper types), Mad-Hatters, Snow Whites, Dwarfs, Harry Potters, etc. 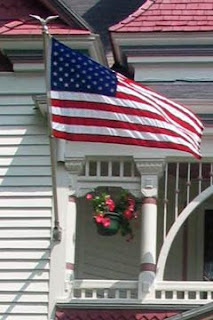 visit the front porch of the Grand Victorian. A special treat, other than the candies, was provided by one of our loyal guests who happens to view Halloween as her one of her favorite holidays. 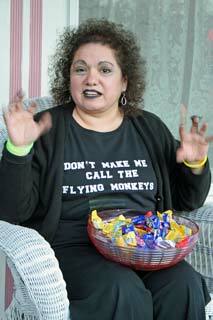 Christine - pictured here – came prepared to apply a moderate amount of makeup and donned her ‘Wizard of Oz’ T-Shirt. Just enough to thrill, but not scare, the young trick-or-treaters approaching our front porch. 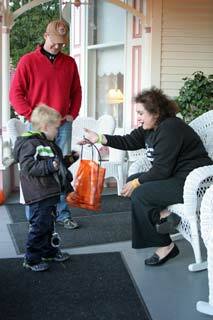 The weather was great and once again Bellaire provided a wonderfully safe Halloween for the young kids to enjoy! We are proud to have played a part in the community event.